Imeglimin is the first orally-available anti-diabetes candidate that simultaneously targets all three key organs of diabetes: the pancreas, the liver and the muscles. Imeglimin targets the two main defects seen in patients with type 2 diabetes: The pancreas by increasing insulin secretion, in a glucose-dependent manner; and the muscles and liver by decreasing the excess production of glucose by the liver while increasing the effectiveness of insulin or 'insulin sensitivity' in the muscles. In preclinical and clinical evaluations to date, Imeglimin has demonstrated the potential to counteract the mitochondrial dysfunction at the root of type 2 diabetes. Both efficacy and safety were observed in 18 clinical trials with over 1,200 subjects treated. Imeglimin displayed a good safety and tolerability profile. 10 studies were conducted with 301 subjects on Imeglimin 100mg to 8000mg/day. We assessed safety, tolerability and pharmacokinetics. 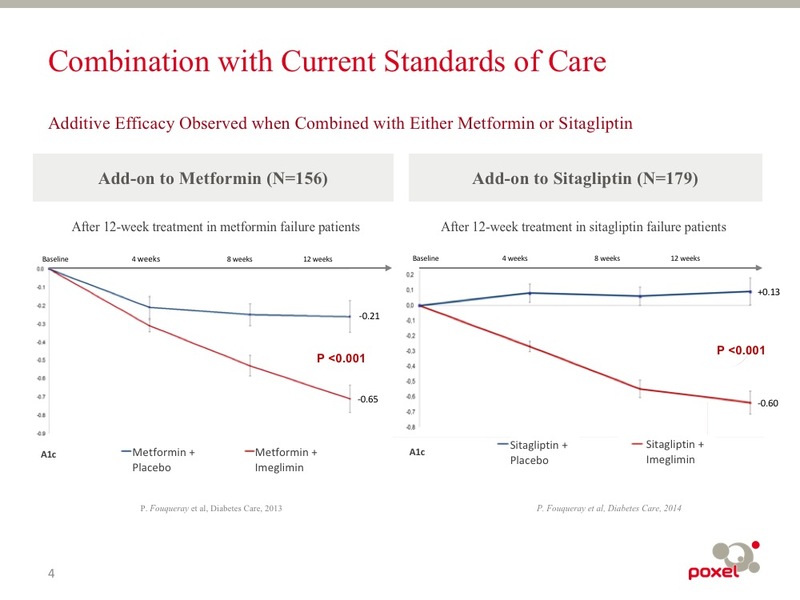 Imeglimin displayed a favorable tolerability profile, including patients with renal impairment. A similar profile was observed in Japanese origin subjects versus non-Japanese origin subjects. Imeglimin displayed efficacy with a good safety profile. 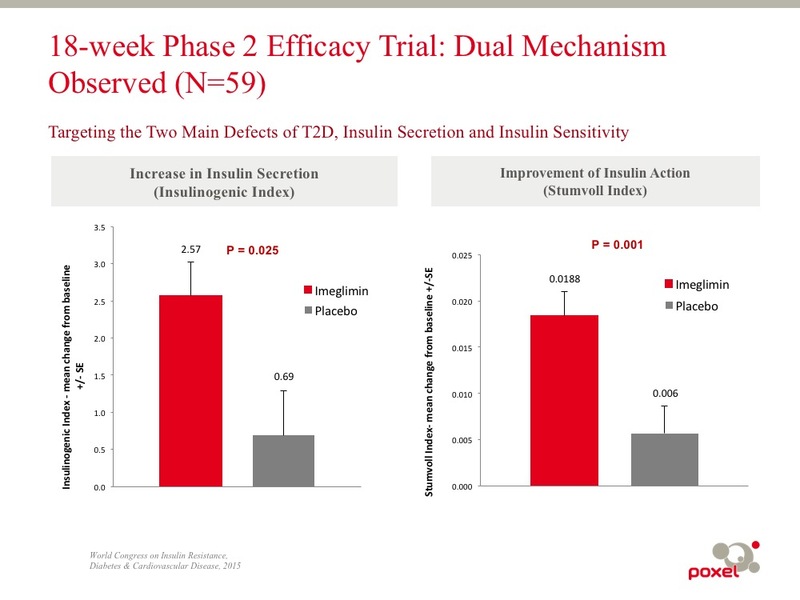 8 studies with 910 patients on Imeglimin 500mg to 2,000mg twice daily. 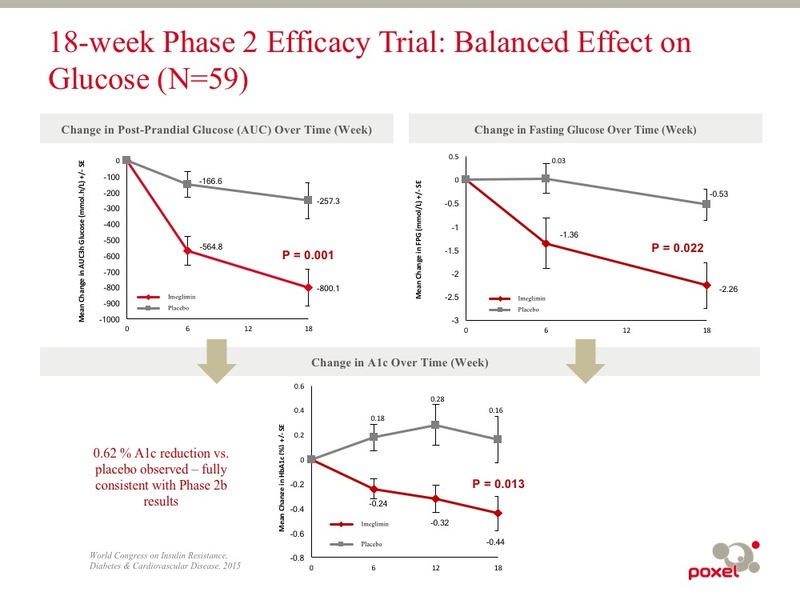 We assessed efficacy on glycemic and non-glycemic parameters, as well as an evaluation on safety and tolerability. 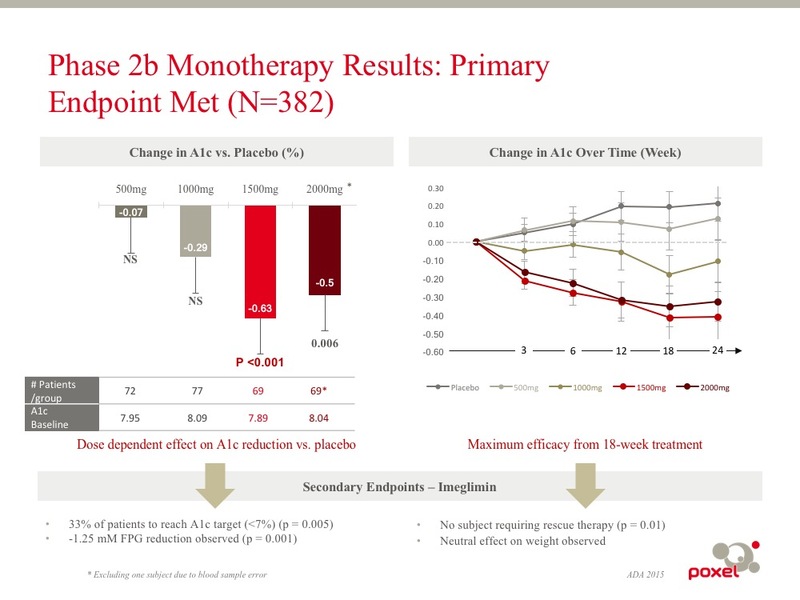 The safety profile is similar to the placebo results. We have a strategic development and license agreement with Roivant Sciences for Imeglimin in the U.S., Europe, and other countries worldwide. 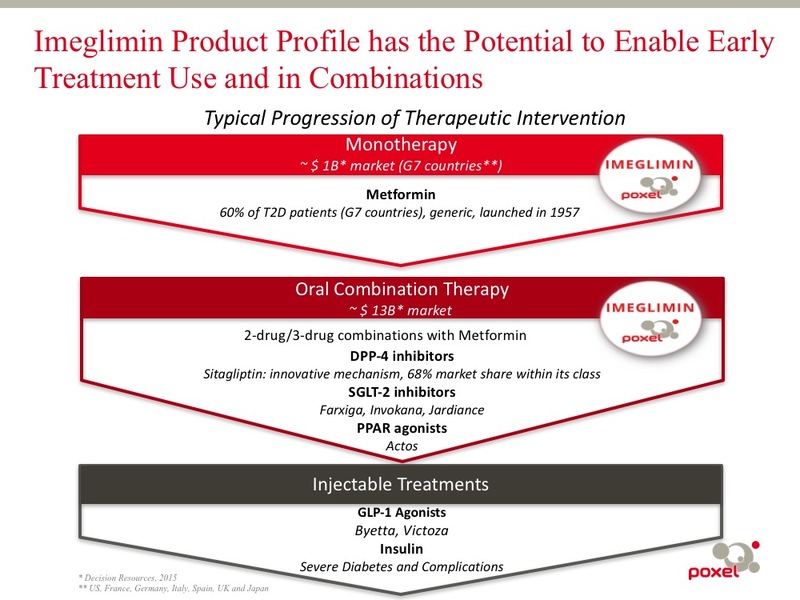 * Activities in 2018 to support the New Drug Application and Phase 3 program will include differentiation studies to confirm Imeglimin’s potential in sensitive patient populations, such as those with kidney-related complications due to type 2 diabetes, as well as the manufacturing of drug product for the Phase 3 studies. The goal is to initiate the Phase 3 program in the U.S. and Europe in 2019. *The Poxel and Roivant agreement includes all countries other than those covered under the Poxel and Sumitomo Dainippon Pharma agreement, which includes Japan, China, the Republic of Korea, Taiwan, Indonesia, Vietnam, Thailand, Malaysia, The Philippines, Singapore, Republic of the Union of Myanmar, Kingdom of Cambodia, and Lao People's Democratic Republic.